Amazon.com Inc. (AMZN.O) kicked off its big Prime Day sales promotion with technical glitches on its website and app, threatening its 36-hour sales extravaganza. Trouble on the site spiked just as the event began at 3 p.m. Eastern time, but declined significantly within a couple of hours, according to Downdetector.com, which monitors web trouble. Shoppers were expected to spend US$3.4 billion on Amazon during the promotion, up more than 40 percent from last year’s Prime Day, according to Coresight Research. “Some customers are having difficulty shopping, and we’re working to resolve this issue quickly,” Amazon said Monday on Twitter, adding that “many are shopping successfully.” The company’s stock closed at US$1,822.49, but slid about 1.5 per cent in extended trading in New York. It wasn’t clear how widespread the problem was, and users were reporting different problems. 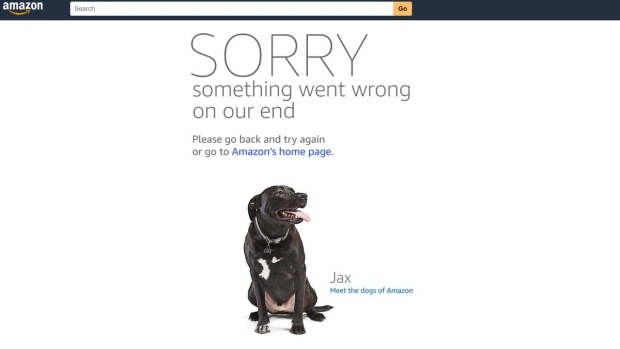 Some people were seeing the “dogs of Amazon” notification that the website wasn’t working, while others said they could add items to their shopping carts, but the Prime Day discount price wasn’t reflected at checkout. For some, clicking on various promotions just brought the person back to the home page. And some shoppers reported not having any problems at all. Megan Quinn, general partner at Spark Capital, tweeted that Amazon’s cloud competitors at Google should be delighted: “Diane Greene is the only person celebrating Amazon Prime Day so far,” referring to Google’s cloud chief. 28 minutes and #AmazonPrimeDay is still down! Jeff Bezos must be fuming. #AmazonPrimeDay is turning out just about as well as #PayYourAgeDay.